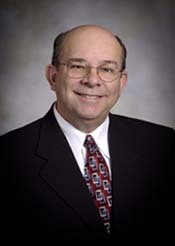 Larry R. Bradley is a native of Missouri. He began his adult work life by accompanying his undergraduate degree in Political Science from Missouri State University with a commission as a Regular Army Infantry Officer. During his Army career, Larry also earned an MBA in Management from the University of Tennessee. Larry split his military career between combat units (with a preference for Mechanized Infantry and Armor) and Research and Development (R&D) activities. His combat unit assignments include commanding a Mechanized Infantry unit in Europe. His involvement in R&D (the business side of the Army) gave him a unique perspective into the political and economic dynamics of military procurement and national defense. Larry's assignments in this area began with the initial fielding of the Bradley Fighting Vehicle System to the Army at Fort Hood, TX. Later, while at the Headquarters of the Training and Doctrine Command at Fort Monroe, VA, he co-authored the Army's revised policy on modifications to Army equipment (a part of Army operations with a price tag at the time as high as $36 Billion). Following his military career, Larry established a second career for himself in sales. Besides the numerous awards and esteem Larry gathered from his efforts, his influence and impact was probably best reflected by the nickname conferred upon him by his superiors, peers and subordinates at a Fortune 500 company: the "Doctor of Sales". Larry's passion for the future well-being of the country he served so long and his concern for the direction he saw that country taking as a result of its political system caused him to found The Center Strikes Back, write Neither Liberal Nor Conservative Be and create the DVD Program Why The Two Party System Isn’t Working Anymore: And What to Do About It. In addition, Larry has become the impetus behind efforts to ensure the will of the majority prevails by bringing Instant Runoff Voting and other voting reforms to elections in all fifty states.